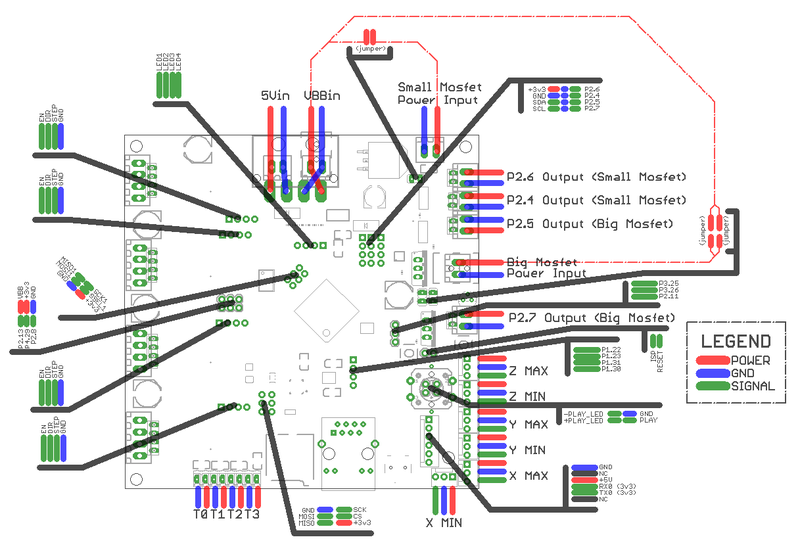 This page is a legacy documentation for the 4-axis only version of smoothieboard, also known as the beta smoothieboard, released january 2013 and sold by Trinitylabs and then Ipsofactio in the first months of 2013. 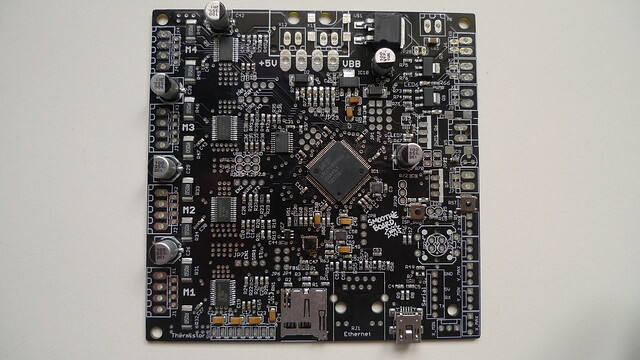 SmoothieBoard is an Open Source Hardware CNC controller board based on the LPC 1769 Cortex-M3 chip. 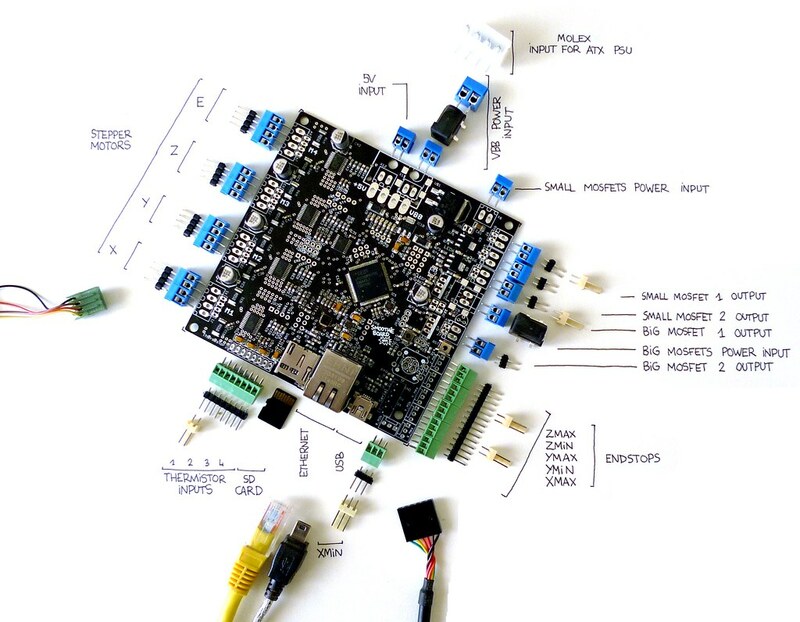 It is intended to run the Smoothie modular firmware ( GPL too ), and is targeted at 3D Printers, Laser cutters, CNC Mills, Pick and place and other small-sized CNC machines. Larger machines can be driven using the bare version and external drivers. A first batch of *beta* smoothieboards has been made, and has been sold out. One other vendor currently has a small non-beta batch for sale, but it won't last long. We are working on having more non-beta boards made, as well as on the 5-axis version. 3D printers, like repraps including extruder control, bed and hotend temp control. And with more to come : laser engraving, SMT pick and place machine, foam cutter, delta robot, and anything else you care to imagine. You can now get a smoothieboard here. We intend to have the best price possible right from the first batch. That would be $120 for the bare ( bare meaning working, just without connectors ) board, an additional $10 for the microSD card and USB cable if you don't have them already, and same thing $10 more for screw terminals, pin headers and power connectors. So about $140 for a complete reprap controller, placing it in the same price range as the cheapest current barebones 8bit reprap controllers ( Sanguinololu, PrintrBoard ), for a much more feature-packed board. Price may vary from vendor to vendor. NXP LPC 1769 32-bits Cortex-M3 MCU, running at 120Mhz. 512kB Flash, 64kB RAM. Drag and drop flashing : simply drop a new firmware file to the smoothieboard to update. USB2 Composite device : shows to the computer as both a Serial device, and a Mass Storage device ( exposing the SD-card ), à-la mbed. 4 Allegro A4982 stepper drivers. Each capable of driving bipolar steppers up to 35V and 2A. TSSOP package allows for much better thermal handling than commonly used A4983/8. Digital control of the current setting for each driver instead of trimpot manual control. Two optional thru-hole ( TO220 ) Mosfets sharing a power circuit : solder what you need. 5V input can come from either a 3.5mm screw terminal, a SMT power jack connector, or a Molex connector as above. Or be taken directly from the USB cable. 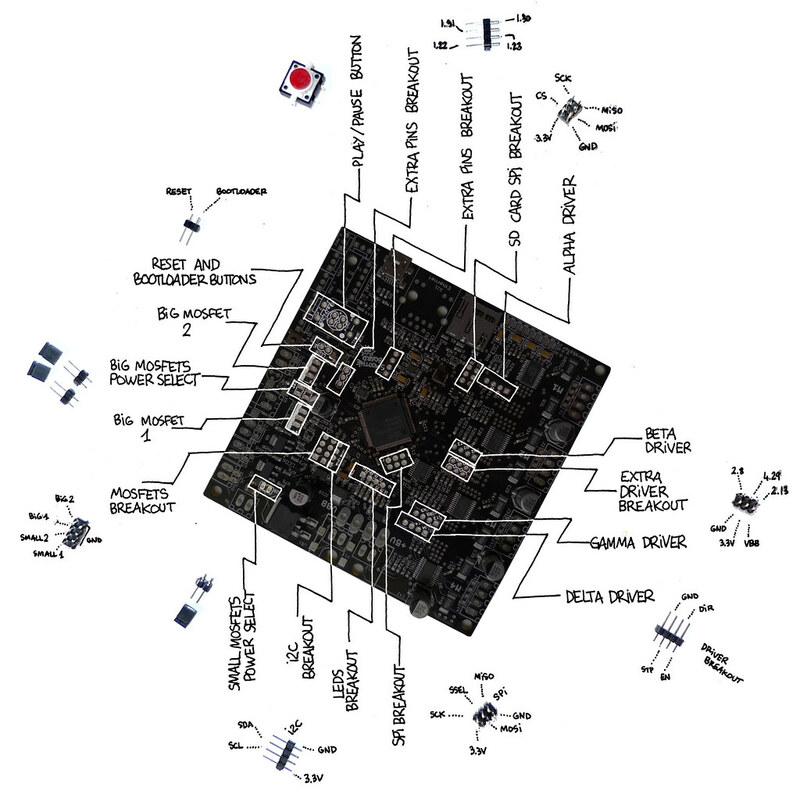 Each of the two Mosfet couple can take its power from either its own 3.5mm screw terminal, or SMT power jack connector, or be connected to the main stepper driver circuit using jumpers. 4 Thermistor ( ADC ) inputs. Runs the highly-modular Smoothie firmware, see home page for more info. Oh and by the way, it's all Open Hardware ( GPL-licensed ). You can find the Eagle files on GitHub. 3D files can be found here on Thingiverse to design cases and plates and such. Warning : Please not the inversion Vbb connectors : the 5mm one has GND to the left, the 3.5mm one has GND to the right. Stepper motors are indicated as X, Y, Z ( cartesian movement axes ) and E ( 3D printer extruder ). However, in Smoothie, stepper drivers are alpha, beta, gamma and delta. They are equivalent, in the same order. This is because if you use for example a non-cartesian arm solution ( for example a rostock, delta or scara robot ), then individual stepper motors don't match specific cartesian axes, things are a bit more complicated. Thus the greek letter naming of the drivers. This has two inputs side by side : one for 5V ( this is optional, you will probably be providing 5V via USB ), and one for VBB ( the stepper motors ( and optionally mosfets ) power input ), that is 12 or 24V. There are several options there. You can solder an ATX molex connector : the same kind you would find on ATX power supplies, that goes into 3-1/2" IDE hard drives. This allows you to simply plug an ATX power supply in there. However, do not use this for high current applications ( >10A ) as that can be much for those connectors. You can also solder 3.5mm connectors ( not recommended unless you use little power ), or 5mm connectors ( Big grey screw terminal, or green base and green screw terminals ). Finally, for the VBB input, there are pads to solder a SMT Jack power plug ( the kind you commonly find on 12V wall plugs ), which is nice to have if you are going to plug/unplug your board a lot. The power input is shared by the two mosfets. Meaning the power input ( 3.5mm pins at the top ) provides power to both of them. You can also take the power from VBB instead of from the power input, using jumpers, see the dedicated part in the non-border stuff section below. These are two big mosfets : AOT240L rated up to 40V and 20A ( more with cooling ). They are usefull for big loads like hotends, heated beds, and crazy things. The power input is shared by the two mosfets. Meaning the power input ( 3.5mm and SMT Jack power connector in the middle ) provides power to both of them. And then each mosfet has its own two-pin output, with the choice between 2.54mm ( not recommended except for light load things like fans ) or 3.5mm. We recommend using 3.5mm connectors ( Blue screw terminals, or green base and green screw terminals ) for all connectors. There are 6 endstop connectors. Though if you use all 6, you are crazy. There are two connectors per axis, min and max. Though you probably just want min. Each connector is a 3-pin 2.54mm connector, providing 3.3V, GND, and the actual input endstop pin ( in this order, from top to bottom ). USB provides the main means of communication with the host computer. The connector is mini-USB. The microSD card stores the config file, gcode files, the web interface files, and other, futury stuff. Thermistors are mostly used for hotends, and heated beds. In conjunction with mosfets and heating elements, they allow for precise temperature control. All of them are optional and not soldered by default. The Play/Pause button is a button with a LED in it. The LED lights up when the board is in pause. That can be because a heater is waiting to be hot for example, or when you click the button. Clicking the button again resumes normal operations. The component is this LED Tactile Button. Solder it if you want to have some pausing fun. Most prefer red, as it's pausy, but there are other choices. Breaks out un-used pins 1.30, 1.31, 1.23 and 1.22. For extension fun. The SD card interfaces with the MCU using SPI communication. In case you would want to not plug the SD card into the smoothieboard, but connect an external SD card connector instead, those SPI pins are broken out. All stepper motors have their enable, step and direction pins broken out. So if you burn one ( which is very difficult, simply don't connect/disconnect them with the power turned on ), you can connect a replacement driver. You can connect an additional stepper motor driver ( like a pololu-like board ) to the board. This is useful for example to add a second extruder. The step, direction, and enable pins are broken out, as well as VBB, GND and 3.3V. The SPI breakout allows you to connect stuff that talks SPI. For example a second SD card. Or something else, your turn to think of something. There are 4 leds on the smoothieboard, in a row, mostly used for debugging right now. Their pins are broken out so they are not completely wasted and you can use them if you really need them. I2C is broken out to connect to peripherals. Lots of stuff talks I2C. Smoothiepanel, and smoothiedriver will talk I2C, and they are awesome. This is an awesome port. This is a pair of pins for jumpers. When nothing is soldered, the power for the small mosfets is taken from the small mosfets power connector. When the pins are soldered, and the jumper connects them to each other, power for the small mosfets is taken from VBB ( the stepper motors power circuit ). Don't connect the power input and the jumper at the same time, that'd be bad, probably. All pins for control of the 4 mosfets are broken out here. In case you want to do something with them. Those may or may not come pre-soldered. If they are not pre-soldered, you can solder mosfets you like here. See the same for small mosfets. It's just two jumpers instead of one, but it's the same thing.